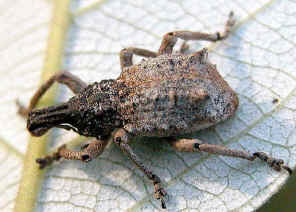 Entiminae commonly referred to as the Adelognatha. 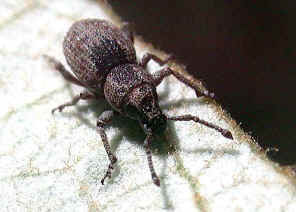 Adults of this subfamily are characterized by having a relatively short and stout rostrum, boarder at the tip. They are from moderate to large size. 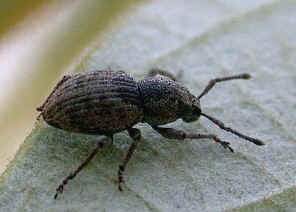 The larvae usually live in soil and feed on root of host plants. 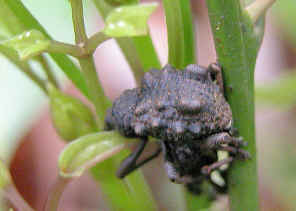 Early summer females lay eggs on leaves. 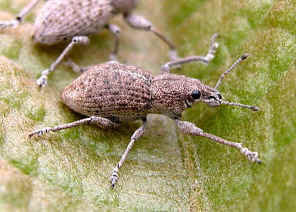 The grubs hatch and crawl down the trunk to the roots, where they commence to feed. 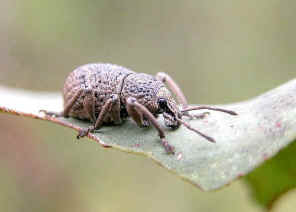 The grubs pupate during late winter in soil. 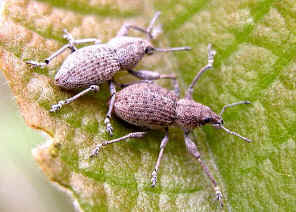 Adults come out during early summer. 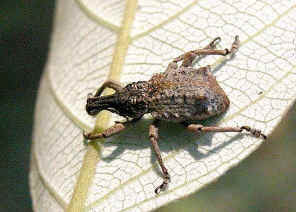 They crawl up the tree and feed on young leaves. They find mates and start a new life cycle. All Leptopius are called Wattle Pigs. 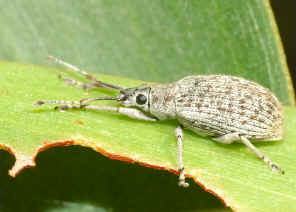 However, not all Leptopius feed on wattle. 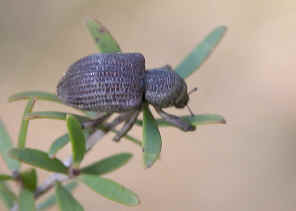 We easily found many of them feeding on different species of Acacia leaf during summer season. For more information and pictures please click on here. 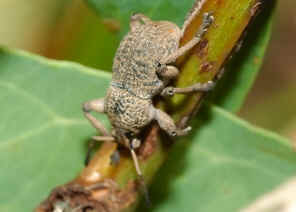 Please also check this page for more infromation on this weevil. 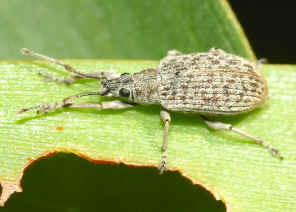 We sometimes found the weevil on Red Ash and gum leaf, as shown in the above pictures. Please check this page for details. 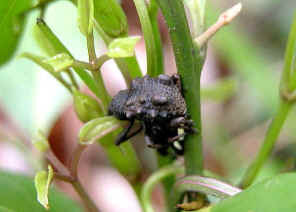 We found this grey-black weevil (above picture) in Griffith University Nathan Campus in mid winter 2002. It was sun bathing in side the Grass Tree. It was dark grey in colour. After we took a few pictures, it dropped on to the ground. Above pictures was taken in Karawatha Forest in mid summer. 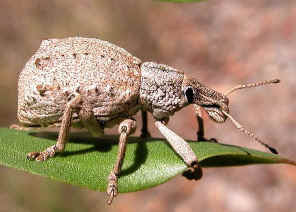 This weevil was always found on Ironbark gum trees. Please check this page for more information. Picture taken in Karawatha Forest during early summer. Please check this page for more details. 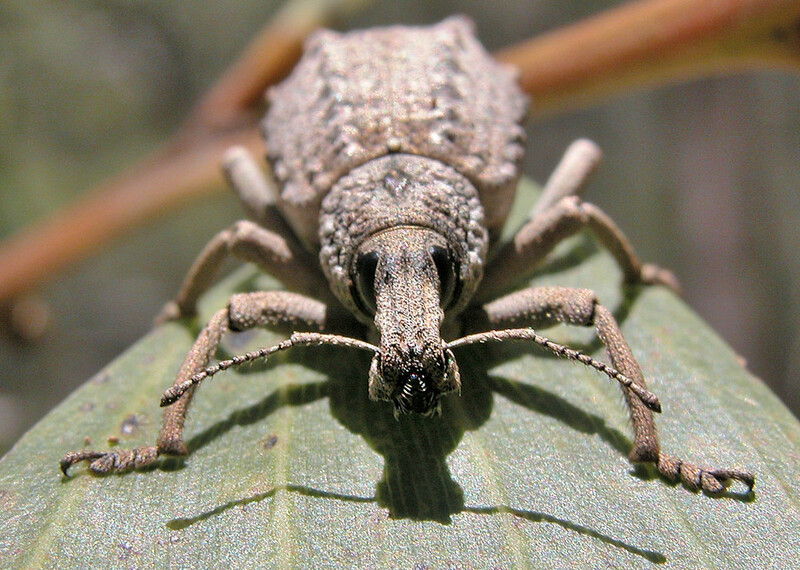 We found this mating couple on a Swamp Banksia leaf in Alexandra Hill during mid summer. More pictures and information please click on here. Pictures taken on Nov 2007 in Yugarapul Park next to Bulimba Creek. Please check this page for more information. 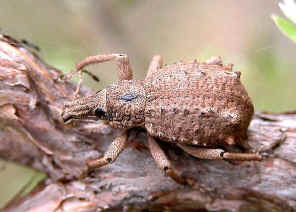 This weevil is dark brown in colour. Picture taken in Alexandra Hill during early summer. Please click on here for more information. 1. 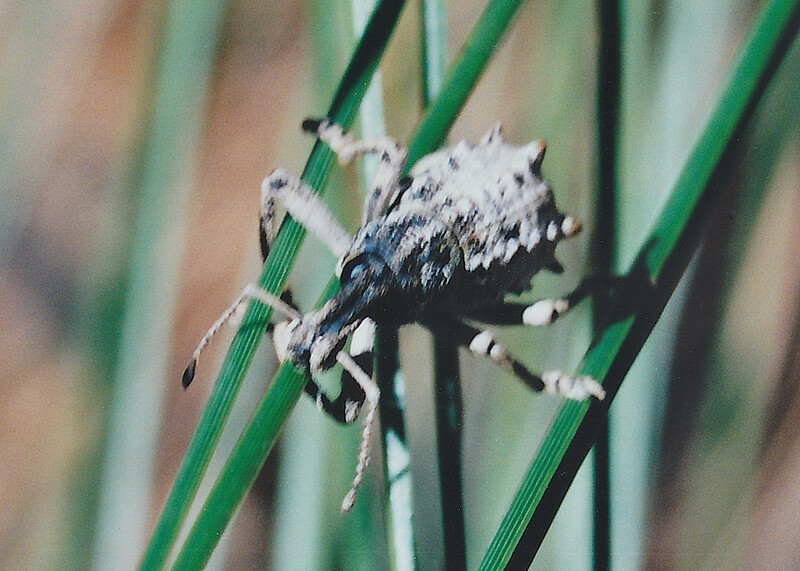 Insects of Australia, CSIRO, Division of Entomology, Melbourne University Press, 2nd Edition 1991, p 682. 2. Insects of Australia and New Zealand - R. J. Tillyard, Angus & Robertson, Ltd, Sydney, 1926, p241. 3. 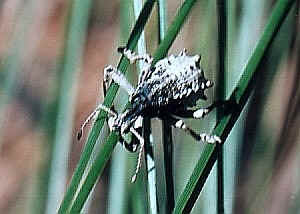 Beetles of Australia - Trevor J Hawkeswood, Angus & Robertson Publishers, 1987, p173. 4. Australian Insects, An Introductory Handbook - McKeown, K.C., Royal Zoological Society., Sydney, 1945, p158. 5. 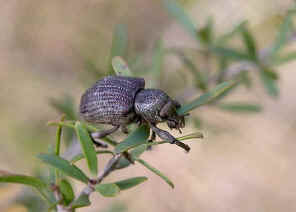 A Guide to the Beetles of Australia - George Hangay and Paul Zborowski, CSIRO PUBLISHING April 2010, p215. 6. 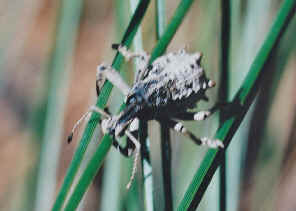 Northern Territory Insects, A Comprehensive Guide CD - Graham Brown, 2009.